CAPE CANAVERAL, Florida -- Astronomers predict that a meteor shower never seen by humans before will appear overnight tonight on May 23-24, 2014. 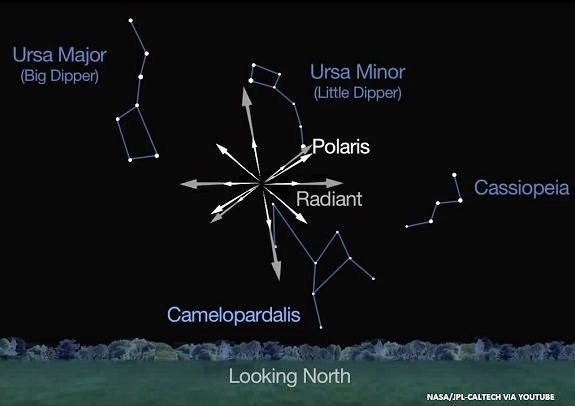 The meteor shower, named the Camelopardalid meteor shower, will be caused by debris particles from the Comet 209P/LINEAR. The dim comet was just discovered in 2004 and comes within Earth's orbit once every five years as it orbits the Sun. In 2010, astronomers Esko Lyytinen of Finland and Peter Jenniskens at NASA Ames Research Center predicted that the Earth would collide with space dust left by the comet on the night of May 23-24, 2014. Most forecasters agree that the Earth will pass through the comet's debris streams on May 24, 2014. However, no one is sure how much debris the Earth will encounter because it depends on how debris was left by the comet back in the 1800's. There could be so much debris that the meteor shower will become a meteor storm. "Some forecasters have predicted more than 200 meteors per hour," said Bill Cooke, head of NASA's Meteoroid Environment Office. The best time to look is during the hours between 6:00 and 08:00 Universal Time on May 24th or between 2 a.m. and 4 a.m. Eastern Daylight Time. Best viewing will be in North America because the peak occurs during nighttime hours while the radiant is high in the sky. You can tell if a meteor belongs to a particular shower by tracing back its path to see if it originates near a specific point in the sky, called the radiant. The constellation in which the radiant is located gives the shower its name, and in this case, Camelopardalids will appear to come from a point in the constellation Camelopardalis. "We expect these meteors to radiate from a point in Camelopardalis, also known as 'the giraffe', a faint constellation near the North Star," Cooke said.